An authentic Montessori preschool/kindergarten guided by a Montessori-certified teacher in a multi-age environment for children ages 2 1/2 – 6. We offer full or half day options, Monday – Friday, according to our year round calendar — refer to the All Year Montessori page. Spruce Tree’s elementary program offers a full-day learning experience for children ages 6 – 12 (grades 1st – 6th) using proven Montessori curriculum guided by a Montessori-certified teacher. Students attend school 8:30 am – 3:30 pm Monday – Friday, according to our year round calendar — refer to the All Year Montessori page. The goal of our enrichment program is to expose students to varied content through hands-on activities. Content theme changes with each academic session. Our extended day (before/after school) programs are offered to all ages for $150 / session. Sunrise: Monday – Friday, 7:30 am – 8:15 am. For the early birds, our Sunrise Program offers parents an early drop off period during which students may eat breakfast, read/draw or use library games/activities. As the day comes to a close, children are encouraged to draw, write, color, read, do puzzles or play logic games during our Sunset Program, a late day option. *Please note that there is no Sunset on Fridays. We reserve Friday afternoons for staff reflection, meeting time and materials preparation. Parents may pick-up anytime during these periods; programs are non-academic, “free time” options supervised by our experienced staff and offered as a convenience for parents. Our school chef, Mr. Oliver Loftus, prepares wholesome, homemade lunches for students Monday – Friday as a convenience to parents and supplement to our cooking and practical life curriculum. Students assist with menu planning, preparation and the buffet service. Drop in lunch available for $8.00 per day. A unique junior high experience with a Journey Track for athletically or musically inclined adolescents and a STEAM Track for those interested in science, technology, engineering, art and math guided by a Montessori-certified teacher in a multi-age Montessori environment for students ages 12 – 15 (7th – 9th grades*). Middle Years Program Admissions Application – this application is for the MYP program only; younger children should complete the application found on our Admissions page. Thank you. Not mentioned in the press release is our school’s plan to develop partnerships with local businesses and professionals, the artisan community, coaches and musicians, and post secondary educators as a way to supplement academic content in an effort to bring real world relevance to daily studies. At Spruce Tree Montessori School (STMS) the students’ need to understand the adult (real) world will be addressed. Through managing micro-businesses as well as taking advantage of learning opportunities in the wider community, STMS students will come to understand the basic foundation of how an economy functions, how to manage money, how to lead others and take direction, how to take initiative, collaborate and persevere, all while using sound work ethics and good judgement. The STMS Junior High will provide adolescents a unique educational experience with three primary components: economy/community, academics, and creative expression. The adolescent period marks the beginning of the child’s journey from childhood (developmental planes one and two) to adulthood (developmental planes three and four), and the continuation of physical, mental, emotional and social growth. It is an age of great social development, of emerging critical thinking and value formation, and a period of self-reflection. Spruce Tree Montessori has begun the process for accreditation with the American Montessori Society (AMS) by affiliating as a ‘Full Member’ school. The AMS membership is a collaboration of teachers, administrators, schools, families, and others who prize Montessori education. As an AMS member school, Spruce Tree is a part of a movement to improve education for children around the globe, with representation at the United Nations and a strong advocacy voice in public policy affairs. The AMS accredits full member schools that undergo rigorous criteria for defining and maintaining the high standards set forth originally by Dr. Maria Montessori. Though the process can take up to three years to complete, Mrs. Binkley is dedicated to implementation of the standards and criteria and plans to work vigorously with the AMS through the accreditation process. 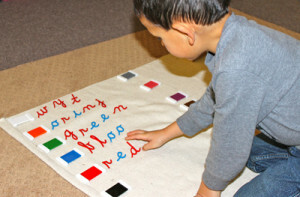 Components necessary for a program to be considered authentically Montessori include multi-age groupings that foster peer learning, uninterrupted blocks of work time, and guided choice of work activity. In addition, a full complement of specially designed Montessori learning materials should be meticulously arranged and available for use in an aesthetically pleasing environment. The AMS also requires that the lead teacher in each classroom hold a Montessori credential from an accredited training center for their assigned level.